Frozen, the Broadway Musical!!! I think I like the musical more than the movie! Bravos to the talented cast. Caissie Levy had an amazing voice as Elsa. Patti Murin wonderfully brought out the playful and lovable character in Princess Anna. Major kudos to Greg Hildreth as Olaf including the voice, acting, puppeteering, and tap dancing! Andrew Pirozzi as Sven was lively and funny (and impressive for moving inside his ginormous reindeer costume all night). Last but not least, bravos to the ensemble of amazing dancers. Costuming was gorgeous right from the opening scene. Non-stop beautiful choreographies brought out the best in the twirling dresses, and filled the stage with actions. Set design (especially lighting design) was incredible and created an unforgettable magic-filled winter wonderland. The plot twist involving Prince Hans of the Southern Isles was much better executed, and more believable in the musical than in the movie (which I had thought was a major weakness for the latter). Altogether, I came out of the theater, liking the musical more than the movie! p.s. Young princess Anna has a penguin!!! This time last spring, my two favorite musicals were two unique productions, Come From Away and The Great Comet, that made their way to Broadway, and known for their distinct stage arrangements, storytelling, and immersive theatre. 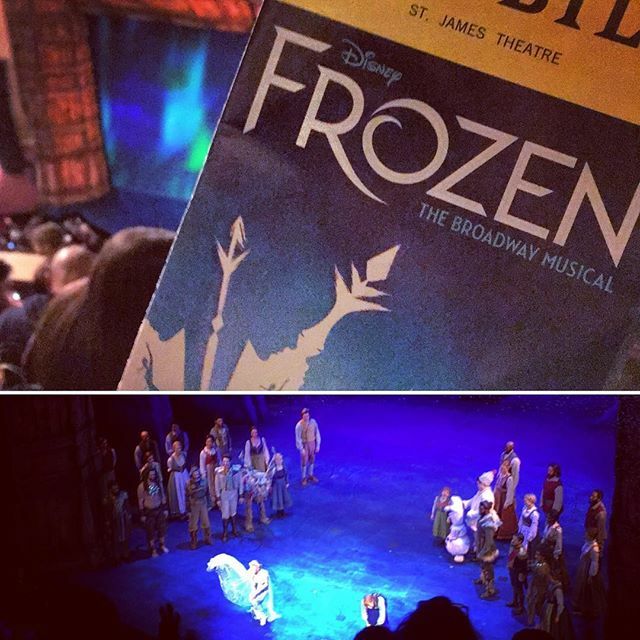 This year, surprising even to myself, my two favorite musicals so far are the Disney- and Nickelodeon-productions of Frozen and SpongeBob, well polished and made straight for Broadway. Will Mean Girls, My Fair Lady, or Summer change my experience in the next three months? ?